It wouldn’t be incorrect if we say that All Roads Leads to Rishikesh, when it comes to Chhota Char Dham Yatra. Playing an indispensable role as a base camp for pilgrims setting out for Yamunotri & Gangotri yatra, Kedarnath and Badrinath yatra, this divine place has so much to offer. 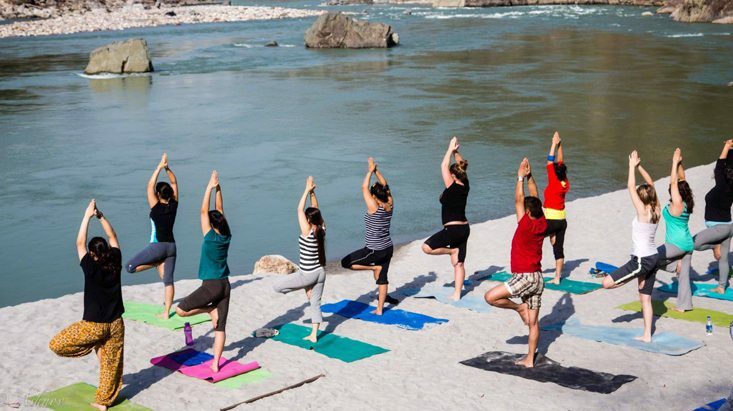 Gaining popularity as a premium yoga destination in India, Rishikesh has given millions of people a ray of hope for a healthy life in the form of Yoga amidst pristine nature’s beauty. Although, there is no wrong time to come to Rishikesh for a Yoga tour but the season of Char Dham Yatra can be the most ideal time. If you have planned to perform the Chhota Char Dham pilgrimage (not necessary to cover all four destinations), you have the good opportunity to stop by Rishikesh and indulge in yoga and meditation by the holy River Ganga. Dubbed as the Yoga Capital, Rishikesh opens its door to all those who wish to learn the art of living in the form of Yoga. Rishikesh is situated on the bank of River Ganga, which appears as an emerald necklace, wrapped carefully by lofty mountains. There is indeed no better feeling than practicing yoga accompanied by pristine nature and Rishikesh is just that. Reckoned to be the best yoga ashrama in Rishikesh, Parmarth Niketan is situated on the bank of a river. The ashram has about 1000 rooms for accommodation. Two yoga classes and three meals a day are offered to the guests, for which a minimal cost has to be paid per day. The ashram is ideal for beginners. Yoga vedic heritage, spirituality, teacher training courses are also run extensively here. Sivanada Ashram is run by Divine Life Society and the yoga courses here are free. The ashram is situated about 3kms from Rishikesh on the route to Badrinath. At Sivananda, yoga is taught on five points including postures, breathing, relaxation, meditation, and diet. Accommodation and food is free here; however, one has to apply to the ashram atleast a month in advance. Home to Patanjala Yoga Kendra, Omkarananda Ganga Sadan offer Yoga classes in Rishikesh. Teaching Iyengar Yoga; this centre offers accommodation at reasonable price; however, one has to book one month in advance here. Along with the yoga classes, one can witness the Aarti at the nearby ghat and can also attend satsang, which is held to keep the ambiance sacred. Founded in 1966, Sadhna Mandir and Swami Rama Sadhaka Gram Ashram is a fine yoga centre in Rishikesh. The ashram focuses on Meditation in Himalayan Tradition. The ashram is also centre for research on yogic meditation. About 100 people can be accommodated in the ashram at a time, so one has to book in advance in order to avoid inconvenience later. Meals and daily classes are available at a very reasonable price here. An ideal place to practice meditation, Shree Mahesh Heritage Meditation School offers 300 hour meditation teacher training course. This eminent school teaches Vedic text, Yoga and Ayurveda along with holding special classes on spiritual development and life healing. The school also runs Health Supportive Lifestyle Program, in which healthy choices about diet, exercise and other lifestyle habits are taught. These are just a few yoga and meditation schools in Rishikesh, of plenty such kinds that have mushroomed in every nook and corner of the city. In case the above mentioned yoga centres are full, you can always knock on the doors of Yoga Niketan, Swami Dayanand Ashram, Phool Chhatti Ashram, Anand Prakash Ashram, Himalayan Yog Ashram, Osho Gangadham Ashram and Sanskriti Yogpeeth.